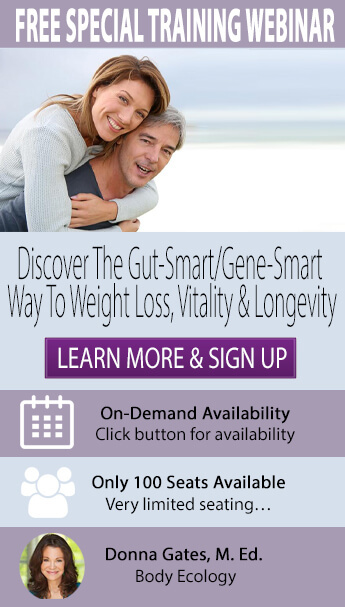 Would you like to look younger, have more energy, lose weight and prevent disease? Then Body Ecology's Principle of Cleansing is an essential practice to understand, practice and master. Cleansing (often called detoxification or "detox") is a necessary and much misunderstood way to improve your health, your appearance, and your immunity. Some people take better care of their cars than their bodies, but just like a car, your body needs regular maintenance, including exercise, rest, and cleaning. Cleansing your body is vital to maintaining your health, preventing disease and improving 'model performance'! The Body Ecology Diet is a system of health and healing that will help your body cleanse while becoming stronger. And the best part? We do this naturally. You will enjoy delicious food and purge your body of pollutants and toxins at the same time. The Body Ecology Diet book now includes a special and important FREE BONUS: Learn More About the Book Now! While we may not even know it, we face an onslaught of toxins every day. In the past 60 years, we've seen more toxins enter our environment than ever before. Toxins lodge in cells, tissues and muscles until your body is completely overwhelmed. Of particular concern for us here at Body Ecology is the effect of decades of toxins that have been accumulating in each successive generation. In other words, many of the toxins in our body were inherited from toxins that were stored in the cells of our parents. This has been happening for many decades now. Tragically, today the body of almost every tiny fetus (human and animal) is formed with inherited toxins accumulated in the egg and sperm cells of its mother and father. In July 2005, a new study shattered the long-held belief that fetuses in the womb were protected from the dangerous chemicals and poisons that the mother was exposed to1. Samples of blood taken from the umbilical cord of newborns contained an average of 200 chemicals that can cause cancer, brain damage, birth defects and other serious illness. Many of these problems will not show up until years after birth. The CDC has stated that the generation of parents having babies today will outlive their offspring2. Unless we make quick changes to our lifestyle and diet, there is a great deal of tragedy ahead for millions. The American Chemistry Council quickly spoke out against the study arguing that chemicals are often found in blood and should not be a concern. So you can decide for yourself on this one. From our own work with autism here at Body Ecology, we know that a fetus in not magically protected by the placenta from these toxins. We also know that a fetus inherits the infections (systemic yeast and viral infections) found in his/her mother's blood and helps set the stage for autism. Because each successive generation is inheriting the toxins of the previous generations, we are seeing earlier and earlier cases of diabetes, obesity, ADD, autism, cancers, and early pre-term labor. Toxic parents have toxic children, and the pattern continues until we make the choice to stop it. There is an interesting phenomenon with toxins. When you add one plus one, the answer is two. With toxins, however, the combination of two or more is often as much as ten times more dangerous. All this being said, focusing on removal of toxins is essential to your goal of becoming healthier. And if you are planning on creating a baby someday, it is essential to the survival of the human race. Is it possible to escape these toxins? While you certainly can greatly reduce your exposure by making conscientious choices - like avoiding non-stick cookware, or using non-toxic home cleaning methods - you can't really escape them. Everywhere we go in this day and age we will encounter toxins. Staying healthy takes more planning and commitment to removing these poisons than ever before. The good news is that you CAN increase your immunity so that you are not as sensitive to toxins. By making the right diet and lifestyle changes, you have a better chance of surviving these difficult times until we can clean up our environment and can live safely in the world once again. Even more good news - when all life was created, the ability to discharge these toxins in an attempt to remain pure was embedded inside of us. Nature has no choice but to cleanse, and we humans must do the same. Animals, too, must cleanse if they are to stay alive. In other words, all life has this ability to push out toxins and this is something to be very grateful for. In fact, stopping the cleansing when it happens inside your body is a serious mistake... a mistake that far too many people are making. Both the New York Times and Smithsonian Magazine ran full-length articles on why South Asian vultures are on the brink of extinction. In short, the reason is because the farmers in Katmandu, Nepal feed their cows diclofenac, a drug used to relieve fever and lameness. The scavenging vultures are one step up on the food chain. Once the cow dies, the scavenger eats the dead cow's carcass and becomes poisoned. The drug then causes acute kidney failure in the vultures after dining on the animals treated with diclofenac. The American Chemical Association states that we should not be alarmed when chemicals show up in the cord blood of your newborns. But we'd like to ask you to decide for yourselves: Do chemicals in our blood matter? In 15 years, the population of the vultures in Nepal have gone from 50,000 nesting pairs to only 500 nesting pairs. Vultures are natural scavengers in nature and remember, "it's not nice to fool Mother Nature." So how are conservationists in Nepal trying to remedy this problem? Because after all, they need their vultures. They have opened a "restaurant" for the scavengers sixty miles outside of Katmandu. At least some of the vultures are being given a chance to eat chemical-free food. Sick and dying cows who have never been fed diclofenac are brought in and when they die, their carcasses are left for the vultures. While the use of diclofenic is prohibited in Nepal and India, the ban is widely ignored. To read the Smithsonian article, visit SmithsonianMag. Cleansing is your body's natural process of detoxifying. Your lungs, liver, colon, kidneys and skin all help to purge your body of toxins through your breath, bile, urine and pores. Most of the time, your body goes quietly about its cleansing process, but other times, you may feel uncomfortable symptoms of an illness, like a fever, cold, rash, the flu - even emotional releases of anger, sadness and fear. When toxins build up over time, your body resorts to more extreme measures to force those impurities out of the cells and organs in an effort to remain healthy. As these symptoms manifest, many people jump to the conclusion that they have caught a 'bug' and take medicines or antibiotics to stop the uncomfortable symptoms of detoxifying. But, medicines that stop the natural cleansing process can actually suppress your immune system and drive toxins further into your body. After years and years of toxic overload and then suppressing your body's own natural cleansing cycle, your major organs will simply give up the struggle and become "diseased". Your body, lacking the life-force to fight, may then succumb to illnesses like cancer, chronic fatigue or acute candidiasis that can kill you. Read Part II, The 14 Key Steps to Cleansing Your Body, Now! Body Burden: The Pollution in Newborns, EWG.com. July 2005. Olshansky, Jay, et al. A Potential Decline in Life Expectancy in the United States in the 21st Century. The New England Journal of Medicine. March 2005.